I wanted my princess to be surrounded with magical, enchanted nursery rhyme decor. I wanted to create a room for my baby girl that would have a fairytale theme. The goal was for visitors to feel like they had taken a stroll through an enchanted forest where mystical magic characters out of children's favorite storybooks dwell. The room was designed in such a fashion so that it will keep her interest as she gets older. Being a preschool teacher, I felt that it was important to add a few natural learning experiences in the room. If you look, you can see Humpty Dumpty is on the castle wall over the crib, Jack and Jill are by the changing table as well as pretty silver bells and cockle shells taken from Mary Mary Quite Contrary. The three blind mice are under the window running into their mousehole as well. Scattered throughout the enchanted nursery rhyme baby decor are butterflies and birds. My baby girl's crib set is a light, blush pink with brown accents. The nursery furniture set is a convertible lifetime crib so it will turn into a double bed. I chose this collection because the crystal ball finials reminded me of a magical princess' bed. To the right of her crib is a decorative white metal étagère that holds a display of pink toy animals that reflects the color of her crib set and some of the colors that were used in the wall mural painting. The wooden shelves on the other side of the crib also has a display of stuffed animals as well as a collection of storybooks that represent the beginning of what I hope will be a lifelong love of reading. What a dreamy, delightful nursery this is! 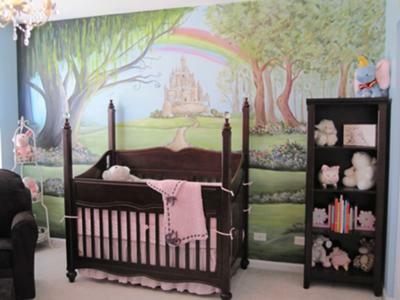 Laura, your storybook nursery design is an inspiration to all of us who have fond memories of Mother Goose Nursery Rhymes and classic fairytales. You did a lovely job decorating your baby girl nursery. Thanks for sharing your enchanting pictures with everyone here at Unique Baby Gear Ideas. I love the story of Little Red Riding Hood and the big bad wolf and I'm going to paint my baby's something like yours. I am looking for fabric in a red riding hood theme that I can use to make a crib quilt and some decorative throw pillows but so far I haven't found what I'm looking for. If anyone sees anything close to what I have described please let me know! Can you please post if this is wallpaper or hand painted? If it is wallpaper, where did you purchase it? Awesome job!! Is the wall mural hand painted or is it a wallpaper mural? If it's wallpaper, could you please post the pattern number? This room is fit for a princess. Great room, best mural I have ever seen! What a lucky little girl! What a beautiful nursery. It truely is a magical enchanted forest for a baby girl. I especially like the way the hills seem to roll down from the castle. Your furniture is beautiful. You did an amazing job!! Amazing! Great idea's! What a fun thing to do. wow what a gorgeous and unique room! amazing! This is the perfect room for baby girl. The decore is gorgeous, room looks soft, cozy and loving. Such a lucky baby girl! This baby girl's room would be a dream come true for any little one! Amazing details, theme, and color scheme all rolled into one ... it's truly a masterpiece! What an absolutely adorable room. Looks like it came out of a book ...which I guess it did in way. Good job! Such a precious room for a baby girl. Proof that the sweetest dreams do come true! Join in and write your own page! It's easy to do. How? Simply click here to return to NURSERY RHYME THEME PICTURES and DECORATING IDEAS.